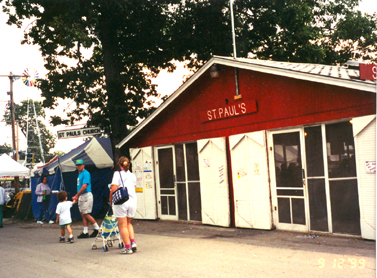 The Fair Stand is a food stand run by the Parishioners of St. Paul's during the Sandwich (DeKalb County) Fair since 1959. We open on Labor Day. The proceeds go into the Father Thomas Kane Memorial Scholarship Fund and also benefit our parish youth. The Fair Stand Board is made up of eleven people from St. Paul's Parish. In addition to the President, Secretary and Treasurer, they board consists of: Jim Martin, David Vincent, Pete Sprosty, Kathy Beltran, Rick Pellegrini, Jenn and Carl Key, and Jim Foley. Each year we hold a Mass on Sunday morning at the AgLand Stage, near our building on the fair grounds. Mass starts at 6:30 AM for all who are on the grounds and all who care to come out to this unique outdoor setting. Tractors pass by and roosters crow and sometimes we are "blessed" with a cleansing shower, but we are there, rain or shine!